Investigators of the U.N. oil-for-food program said Tuesday they are "urgently reviewing" new information that suggests U.N. Secretary-General Kofi Annan may have known more than he revealed about a contract that was awarded to the company that employed his son. The December 1998 memo from Michael Wilson, then a vice president of Cotecna Inspections S.A., mentions brief discussions with Annan "and his entourage" at a summit in Paris in 1998 about Cotecna's bid for a $10 million-a-year contract under oil-for-food. If accurate, the memo could contradict a major finding of the Independent Inquiry Committee — that there wasn't enough evidence to show that Annan knew about efforts by Cotecna, which employed his son, Kojo, to win the contract. Cotecna learned it won the contract on Dec. 11, 1998, days after the meeting. The statement from the Independent Inquiry Committee, led by former Federal Reserve chairman Paul Volcker, said it would "conduct additional investigation regarding this new information." U.N. spokesman Fred Eckhard said U.N. officials reviewed the final records of the Paris trip that note every meeting that took place, "and there is no metion in that trip record of any exchange with Michael Wilson." "We spoke to the secretary-general who is in Paris today, and he has no recollection of any such exchange," Eckhard said. In a statement released earlier Tuesday, Cotecna said it had found the memo as part of its "continued efforts to assist investigators." The Geneva-based firm again denied that it committed any wrongdoing in obtaining the contract. The memo "may result in speculation about the procurement of its oil-for-food authentication contract," Cotecna said. "Cotecna once again confirms that it acted at all times appropriately and ethically in its bidding for, winning and performing that contract." 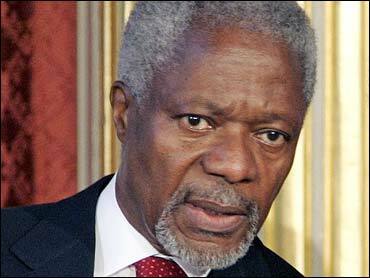 Both Annans also deny any link between Kojo Annan's employment and the awarding of the U.N. contract to the company. The internal Cotecna memo from Wilson, a childhood friend of Kojo Annan, was first reported Tuesday by The New York Times. In the memo, a copy of which was obtained by The Associated Press, Wilson said he "had brief discussions with (Kofi Annan) and his entourage" about Cotecna's effort to win the contract. Cotecna "could count on their support," Wilson wrote. The memo, dated Dec. 4, 1998, was written a week before the company won the U.N. contract. Eckhard said the views attributed to Annan in Wilson's memo "could not have come from the secretary-general because he had no knowledge that Cotecna was a contender for that contract." He said the United Nations had turned over the records of the Paris trip to Volcker. In an interim report in March, Volcker's committee accused Cotecna and Kojo Annan of trying to conceal their relationship after the firm was awarded the contract. It said Kofi Annan didn't properly investigate possible conflicts of interest surrounding the contract, but cleared him of trying to influence the awarding of Cotecna's contract or violating U.N. rules.